When running performance tests, you often need to parse and extract values from a response sampler. 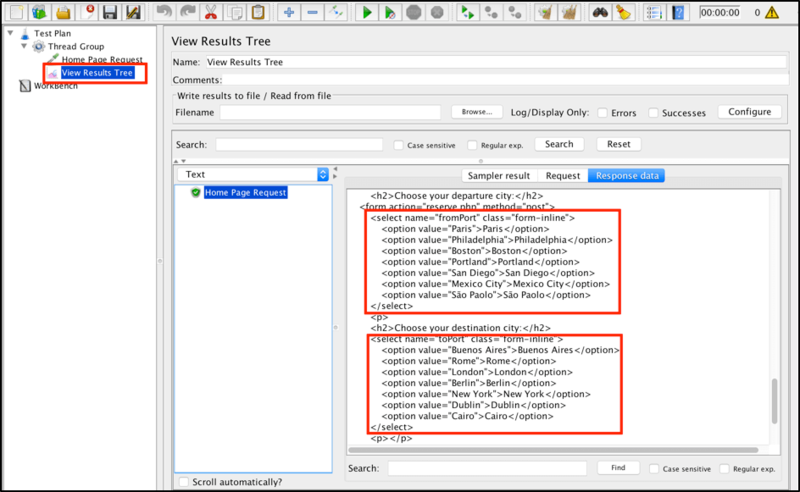 For example, when requests require values from a previous response, like when the first request returns a unique identifier which should be used in all subsequent requests. Or, when you need to verify specific values in responses for test assertions. If you are creating your performance scripts with JMeter, you can use the list of different PostProcessor elements to extract the required values. One of the most convenient ways to parse and extract values from JMeter response samplers is to use the CSS/JQuery Extractor. The CSS/JQuery Extractor is a PostProcessor that provides flexibility by commonly used syntax for extracting the requested nodes and storing parsed values into the given variables. This extractor can be applied to requests by using specified CSS or JQuery locators to extract all matching values from the response or JMeter variables that might be used afterwards in subsequent requests. Let’s take the blazedemo.com web app (our usual demo) to show the CSS/JQuery extractor in action. This web application shows a simple travel agency that fetches flight data, based on specified departure and destination cities. Let’s assume that we want to dynamically search different flights based on a combination of cities. 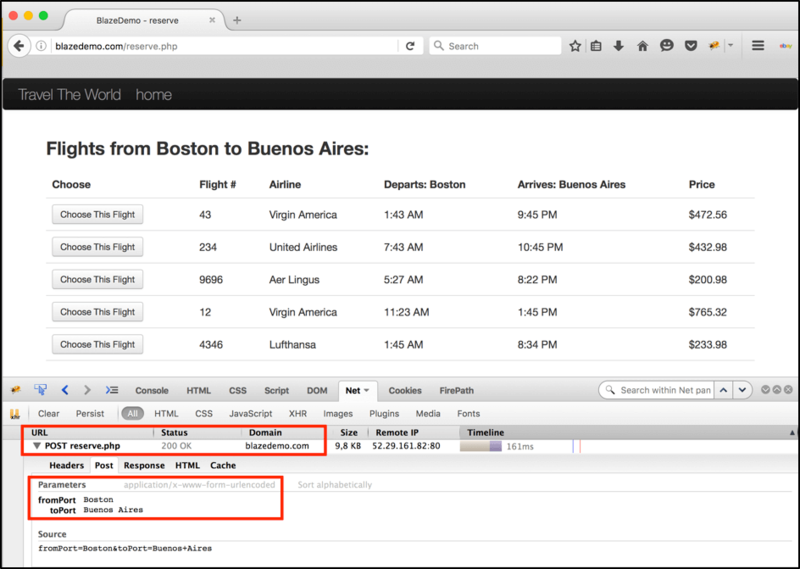 The ‘Find Flights’ button sends a request to ‘/reserve.php’ endpoint with ‘fromPort’ and ‘toPort’ parameters. 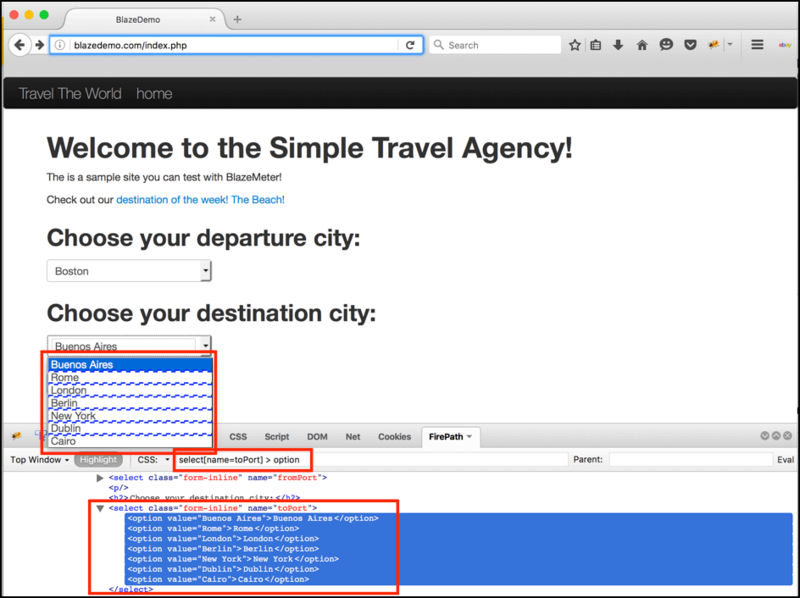 To perform dynamic calls for different combinations of departures and destinations we should extract the city names from the selected elements and then send a post request to reserve.php with that combination of city names as parameters. 2. Since we need to use the default http protocol and get the request type in the HTTP Request, it is sufficient to specify only the server name (blazedemo.com) and endpoint path to the Home page (/index.php). 5. The next step is to add the CSS/JQuery extractors to the JMeter script. CSS/JQuery Extractor Implementation - there are two implementations that can be used. While there are no significant differences between them, some syntax elements might vary (see for more details: JSoup (default) and Jodd-Lagarto). Reference Name - name of the result JMeter variable that will be used as a value container. Attribute - the name of the html attribute that can be used to extract values from nodes that matched the selector. If empty, the combined text of this element and its children will be returned. Default Value - the default value that can be used if the locator isn’t found. 6. Since the main goal of the script is to find random flights, we need a CSS locator that returns all departure cities, and then a second extractor for all destinations. After choosing the desired parameters, retrieve the values in JMeter by adding two CSS extractors to your JMeter script. You can put the “NOT_FOUND” value as the “Default Value” parameter for debugging purposes. If you have issues with locators, you can quickly find them based on the default values in cities variables. You can find a detailed explanation of CSS syntax here. JQuery's selector engine uses most of the same syntax as CSS with some exceptions. For selecting an arbitrary locator, you can use field Match No. with the ‘0’ value, which returns a random value from all found results. It is also worth mentioning there is list of very convenient browser plugins to test CSS locators right into your browser. For firefox you can use ‘Firebug’ plugin while for Chrome ‘XPath Helper’ is the most convenient tool. Let’s use the values we got above to send the next request. 9. 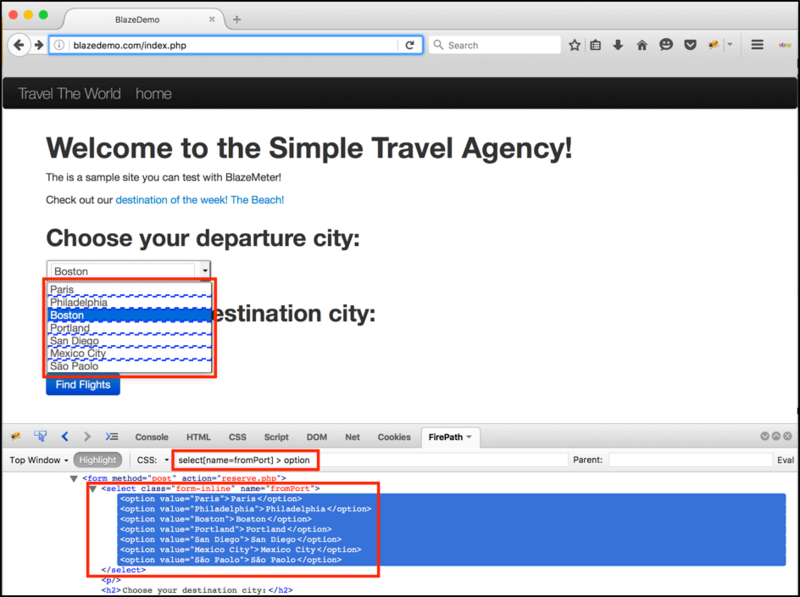 We now want to simulate the execution of the ‘Find Flights’ button from the Home Page, which transfers a request with specified parameters (departure and destination cities). This button sends a call to /reserve.php endpoint path with two parameters: fromPort and toPort. 10. In the “View Results Tree” listener you will find different values for defined parameters in each subsequent execution of the script. That’s it! You now know how to use the CSS/JQuery Extractor to parse and extract values from JMeter response samplers. Learn more JMeter in our free 5 day online course. See how JMeter is enhanced by BlazeMeter by requesting a demo, or just paste your URL in upload a JMX file into the box at the top of the page and your test will start in minutes.